Having cancer in the family has made me not only conscious of this disease but afraid as well, although there are many ways to easily detect breast cancer now, it is still good to be careful and be aware. I thank, Marikenya for this tag for a cause. June is the Breast Cancer Awareness month and this blog tag’s objective is to spread the information on this killer disease. • The first sign of breast cancer usually shows up on a woman’s mammogram before it can be felt or any other symptoms are present. • Risks for breast cancer include a family history, atypical hyperplasia, delaying pregnancy until after age 30 or never becoming pregnant, early menstruation (before age 12), late menopause (after age 55), current use or use in the last ten years of oral contraceptives, and daily consumption of alcohol. • Early detection of breast cancer, through monthly breast self-exam and particularly yearly mammography after age 40, offers the best chance for survival. • Ninety-six percent of women who find and treat breast cancer early will be cancer-free after five years. • Over eighty percent of breast lumps are not cancerous, but benign such as fibrocystic breast disease. • You are never too young to develop breast cancer! Breast Self-Exam should begin by the age of twenty. You can help save lives of many women by spreading the word about The Breast Cancer Site and clicking on the pink button many times as you can. 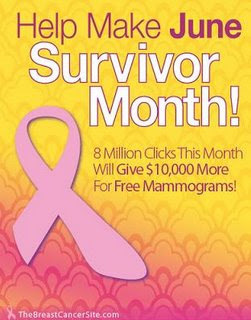 If The Breast Cancer Site receives 8 million clicks on the pink button in June, their premier sponsor -Bare Necessities- will donate $10,000 for more free mammograms. CLICK the pink button today! To my blogger friends, please help this tag rolling to reach more and more women and even men, everyday. I agree - a tag for a great cause!! I actually just posted this - but thank you for thinking of me! !